If you’re moving a big refrigerator then you’ll need to take some tips on how to do it the right way. These big appliances might not seem delicate but if one doesn’t move them properly you can damage the appliance and it may not be covered in the warranty. It’s all a matter of looking at the basics and using the right tools and common sense. First of all, make sure you’ve got the right tools to move the appliance. Ask a professional for help if you’re not going to use a professional service. Lots of tips can be had here and there but since refrigerators contain several moving parts, one slip up could cause damage to your appliance, your home or office, and worse to yourself. These refrigerators can weigh a good several hundred pounds and be quite large to boot. Use measuring tape to check the dimensions of the fridge. Make sure it will fit going out of the doors and hallways as you may have had modifications to the home since it was first in stalled. Once you know its size you can then get the dolly for transporting the fridge set just right for balance and any protective covering to avoid scrapes and scratches. Not only scrapes and scratches to the fridge but also to your home or office. Of course you’ll need a dolly that will support the refrigerator. Add to that moving blankets and whatever other protective covering for the outside of the fridge. You’ll need cleaning supplies for before and after moving. Packing tape if necessary. Box cutters or scissors. Next, before you move the fridge you’ll need to clean it out. That’s what the cleaning supplies are for. Don’t use anything that uses too much liquid, instead use the spray cleaners slightly and wipe up to a dry any excess. The last thing you want is some liquid oozing out of the fridge and making transporting it hazardous. 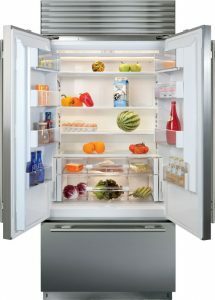 All contents of the fridge will either go into an additional or spare refrigeration unit. If you’re moving to a far off place, take the items you must have and store them in coolers or in dry ice. Especially those hard to come by condiments and choice cuts of meats. Once you’ve emptied the fridge, unplug it and secure the plug properly so it doesn’t get in the way of moving or get damaged. Let the fridge defrost and go in and clean up any excess debris and liquids. Take out the shelves and cabinets and store them properly with protective covering. If there’s any glass plates or shelves inside, use materials that will protect them from breaking and causing injury. If the fridge came with packing materials for this, make sure you’ve kept those packaging materials around or at least know what they were made of. Once that’s done, secure the doors with rope or some binding cord or material. Give the fridge the once over look to make sure things like magnets and postcards aren’t still attached to doors or the sides. Next is the big step, moving the refrigerator out. Make sure the path to the outside is clear. The dolly’s wheels should be double checked for flaws and any debris that might have gotten stuck in them. With a 300lb refrigerator on it, any debris in the wheels will dig into the floors. Secure the refrigerator and don’t just jury rig it. Do a professional job with ropes, cables, straps. The fridge shouldn’t move in any way once on the dolly. Next is to bring it to the stairs if any, and lower it bottom down first. Once to the moving truck use whatever is available like a ramp to move the fridge on and keep it upright always. Secure it safely and smartly so it doesn’t obscure or interfere with the operation of the truck nor pose a hazard to people and other objects. If you’re now moving the fridge into its new home, keep the same common sense and procedure. No obstructions in the way, make things secure. Refrigerators take time to orient so once you’ve got the unit in position and plugged in, just wait a few hours and expect that it will take about a few days for everything to return to optimum condition as the fluids in the system have to get flowing just right. A fridge is an expensive appliance and normally hiring a professional is recommended but by following the steps above you should minimize any problems that may arise.